Mahak Goidani interned at Microsoft this summer and shares her work-culture experience over there. 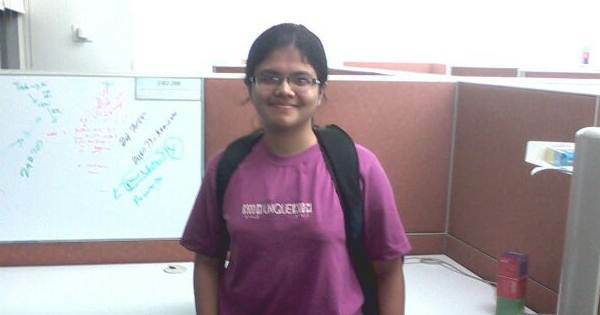 Mahak is now a third year Computer Science & Engineering student at IIT Madras. Read on and explore more about Microsoft yourself. I feel greatly obliged to the God for giving me this wonderful experience in life to go and work in Microsoft. I also thank my parents and family members for all their blessings and wishes for me. I always had a dream to join one of the top tech companies like Microsoft and Google. As a part of the process of campus placement in our college, Microsoft was the first company which came to our college and after successfully clearing all rounds of interviews, I got the offer for internship in Summer 2014 from Microsoft. I must tell that I was not very excited to join the company at that time as the stipend promised for was lower as compared to others. My institute has a rule that once a candidate gets into a company, he/she can’t reject that offer and is neither allowed to sit for any other company as well. So I had to join Microsoft as an intern. But today, I am much more than happy that I got a wonderful opportunity to work in Microsoft and had an experience of the awesome work culture over there. I feel honored and obliged that I got a chance to work in such a fantastic place. This rule of my college turned out to really lucky for me. Before even the start of the internship, all the mails which were intended towards the employees of the company were also sent to all the interns, from this I want to convey that Microsoft considers the interns as their employees and not just someone who will come and work for 2-3 months and leave. It takes special care of people, and it really took a great care of all the interns. Microsoft is not just a company; it is a ‘culture’. Before joining Microsoft, I had an experience to work in the corporate culture as I had done two internships previously. So I was not at all nervous on my first day when I joined the company. But I was amazed by the campus of the company, which is the biggest in Hyderabad city. It is very natural, it has hills, fountains, so many trees, plants and flowers inside the campus, and it feels awesome to work there in the natural beauty. The buildings are very huge and wide. The office is so big and wide that there is an internal shuttle within the campus to take from one building to another. I was also amazed by the security and maintenance of the office. The office seemed to me more beautiful than a palace. On the first day, all the interns had the orientation sessions in which we were told about the rules and regulations of the company and introduced to our teams, mangers, mentors and buddies and told about the projects which we were expected to do. I liked the concept of buddies in MS which is – each intern was assigned a buddy to whom he/she could ask any informal questions about the work or the workplace or any general question and they were more like friends to us. Then I got my identity card which I love the most. It gave me a special feeling of being an employee. On the first day there was a campus tour arranged for all the interns during which we all walked through the campus to see the different places and buildings inside. I was surprised to see such a beautiful and huge campus which even had playground for cricket, football, basketball, tennis, etc. Also I was amazed to see the indoor games such as table tennis, snooker, etc within the buildings and near our cubicles. I was then assigned a cubicle where I used to sit and work. There are facilities for these games for the employees so that they can take a break and get refreshed. Also there were pantries on each floor where people can go and have coffee, tea, milk, soft drinks, etc. This internship gave me an opportunity to meet all the other interns from different colleges in different places of the country and I liked mingling with all of them. Work at Microsoft was never tiring or troublesome or boring since we could always take a break and talk to others or play with them. There were many events organized especially for the interns such as the Intern Movie Night in which we saw some movies with others and then had awesome parties. There was intern outing arranged for us in which we had a treasure hunt in the city, followed by games and party. Then we there was an NGO visit arranged so that we can go and help the NGOs and see the work which they are doing. Then there was a poster making competition in which we all had to present our ideas about the motto of the company via posters. The company also took us to the IPL Match which took place in Hyderabad. All this was fun and that too in a very short span of time. All the interns were treated as the Employees of MS and were invited in the appropriate meetings and parties as well. I got almost all the facilities which any other employee of MS could have got. I worked like I am a FTE (Full Time Employee) of MS and this also gave me an opportunity to experience a sense of responsibility. I got an awesome opportunity to work on the latest technology, which is not even released in the market. Also I got to see the latest products and work on them like Windows 8.1, Surface 3, XBox. I was given my own laptop to work on and I liked the MS internal communication and mail system – Lync and Outlook, and till today I miss them. The interesting part is we were not supposed to address our manager or any other employee as “Sir”/”Madam” since that is considered as too formal there. Initially I felt awkward but then I quickly got used to it. I found that in this internship, I quickly got adjusted in the work environment and the workplace, which is very unusual for me. I quickly started mixing with people and discussing with them. Initially it was a bit difficult to get onto the technology since it was very new to us. But whenever I approached anyone for help, they were always very kind and helpful and always helped me to understand the tools and solve the problem. I found that the people there are different, they are very kind and humble, they don’t envy anyone and always extend their hands to help others out. There are many tutorials and training sites which are only internal to MS but we interns had got access to them to learn from them so as to enhance our skills. There were special teaching sessions arranged for interns so as to make us comfortable with the tools and the technology. This was a great learning experience for me. I worked on three different projects, all completely different. I designed and implemented a battleship game as a part of a team of interns for the ripple center which is a gesture recognition devise and one of the latest technologies, then I worked on data warehouses and made products which measure the quality of the product and then wrote code for automation. I also wrote two certification exams and cleared them successfully with the scores being 92.5% and 89%. I used technologies such as PowerPivot, PowerView, CHEF (ETL Framework), Microsoft SQL Server, Visual Studio, SharePoint, C#, HTML5, TypeScript, CreateJS, AngularJS, MetroJS, d3JS. This was a great learning experience. I explored new things and became much more passionate about technology. The part of the internship which I liked the most was that the office timings were highly flexible. We could come at any time, go at any time, there was no attendance, the only thing which mattered was that the work should be complete properly on time, employees can do the work the way they want, at whatever time of the day want, what is important is that the work should be complete on time. Also at MS, we can choose what work we want to do and we can choose which team we want to join. Also the employees and we as intern were provided transport facilities throughout the day. The buses used to pick us up in the morning and the cabs dropped us to the residence even very late in the night. The infrastructure is very nice and comfortable and provides a very nice working atmosphere. I used to go at 10 in the morning and come back at 12 in the night, but believe me it was never hectic, it was never tiresome, I enjoyed staying in the office, as we never worked throughout the day, we also used to have a lot of fun and games as well. The office was like a home for me. This internship gave me a good opportunity to develop my technical skills. I did a continuous exploration to rectify the technical difficulties that I faced along the way. I was able to apply the concepts learnt, in the real world. The internship also provided me with an opportunity to work as a part of a big team. This internship helped me in enhancing my technical knowledge by providing a hands-on experience on different technologies. It also gave me a good exposure to the industry and an opportunity to understand the corporate culture. In the end, based on my performance I was recommended to give the Pre Placement Interviews for the position of a Full Time Employee in Microsoft. I successfully cleared these interviews and got the Pre Placement Offer from the MS team. We all used to have breakfast, lunch and snacks together, and it was like a society and I liked mingling with people in such a way. I made some new friends whom I will always be in touch with throughout my life. Every day was a new day for me, every day I used to go with a new positive energy and zeal to do the work. I completely enjoyed my internship and towards the end when the internship was coming towards an end, I used to feel very unhappy and sad, I always wanted to stay back there in the office and never come back again. I never wanted the internship to get over. I did the internship for a duration of two months and this was the first time in my life that I felt that time flew just like an arrow, it just passed as if I have blinked my eyes. On my last day I felt as if I had just joined on the previous day, and I felt very sad that one of the awesome periods of my life has come to an end. I wish to go back and work there sooner and live that life again. I try to live those moments through the sweet memories which I have in the photos which I took there. Also I became independent and learnt to manage small things in life such as going to the bus stop, travelling alone in a new and different city and talking and negotiating with new people in life, and doing the daily activities on my own. My restricted view of the world also enhanced and now I think along different dimensions also, and I am open to new ideas and new thoughts. After the internship I could see many positive changes in me. I could see that I am more confident than before and now I can take and fulfill responsibilities better. I have started interacting with people, mingling with them more than before; my personality has positively changed after this internship. Also, whatever be the situation I am always happy. Whenever I feel sad/disturbed, I recollect all my internship memories and then I become happy and get back again with positive energy and freshness and more enthusiasm to work harder to achieve my goals in life. I have a lot of respect for the company and all the employees with whom I worked with and interacted during my internship. I wholeheartedly thank it for taking such a great care of all the interns and employees and providing us with so many perks and benefits, and keeping us happy all the time, due to which I think our productivity was 100% toward the work. I can go on narrating the my experience and don’t feel to stop, and if time and the word limit would have permitted I think I would have exceeded more than 20 pages and still I would have felt that I have not spoken much and would have kept on narrating. I have tried to convey my wonderful and awesome experience and all my beautiful memories through this short story and there are still many things which I think could not be expressed in words, they can only be experienced and enjoyed. Want something similar for yourself? Check out the latest Internships in Hyderabad. can u provide info how to do summer internship in microsoft? Please let us know your query. We’ll be happy to help. What you learn in internship?? Please visit here for the career at Microsoft. Hellow :-) I am Sindhu from computer Science Engineering,doing the third year of my course in Anna University,trichy.I cherish doing an Internship at Microsoft.But this company is not offering any interns to our college.Is there any other way to get an Internship here? Thanks in advance. Thank you for writing in. Please visit here for the career at Microsoft.